What makes a Person Shy? 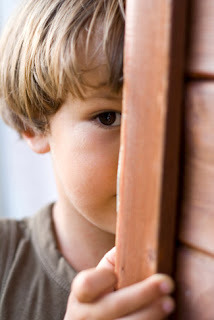 Not only there are environmental causes of shyness; increasingly, scientific evidence points to a strong genetic predisposition to shyness, just as you may inherit a tendency toward diabetes, heart disease or obesity. Study shows that babies wore caps with sensors that detected the brain's electrical activity. Babies later found to be shy had more activity in their frontal lobes than in their left. Babies who were more "uninhibited" had the opposite pattern of brain waves. While many shy people are introverts, introversion and shyness are two very different personality classifications. First introverts prefer solitary, nonsocial activities and settings. Shy people may also prefer to be alone but they go one step beyond and fear social encounters, unlike a "pure" introvert. Extroverts or those who prefer socially engaging activities and settings can be shy. However, generally speaking, if an extrovert is shy it is in a private setting with negative thoughts about self.